Carnival Sensation underwent a refit to add numerous balcony staterooms. Photo courtesy of Carnival. 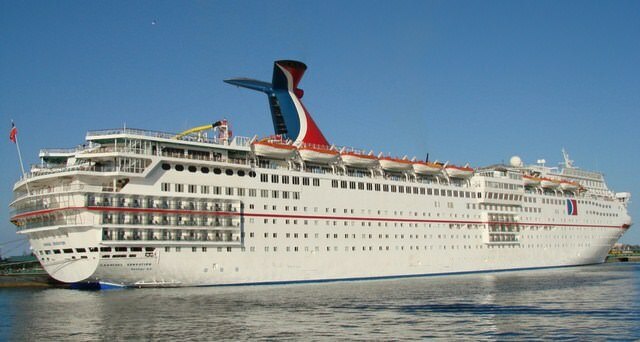 Classic Carnival, the 70,367-ton, 2,052-passenger Carnival Sensation debuted nearly 20 years ago. The third of an eight-ship series with risqué names, Sensation continues to provide a party at sea in a Vegas-style setting with lots of neon, chrome and bright colors providing the glitzy backdrop. Following a two-week-long dry dock in early 2017, Carnival Sensation resumed its year-round schedule of four- and five-day cruises from Miami. 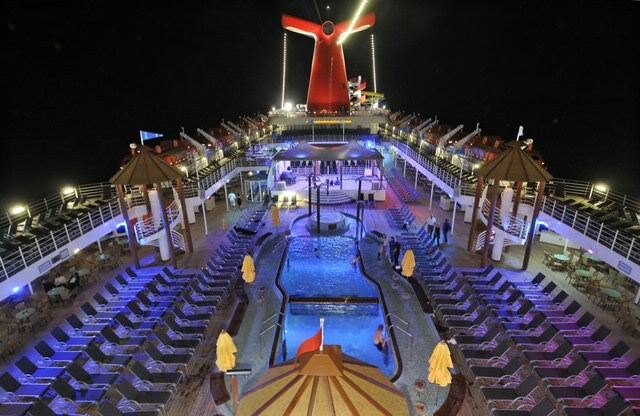 Carnival Sensation is the third Carnival ship to undergo a refurbishment this year with Carnival Dream and Carnival Ecstasy receiving new spaces, as well. Guy’s Burger Joint: afree-of-charge poolside venue developed in partnership with Food Network personality Guy Fieri serving hand-crafted burgers and fresh-cut fries enjoyed amidst a décor that celebrates the chef’s California roots and love of car culture. RedFrog Rum Bar:a poolside watering hole offering the quintessential Caribbean vacation vibe with refreshing Caribbean rum-based frozen drinks and beers, including Carnival’s own private label draught brew, ThirstyFrog Red. BlueIguana Cantina:a complimentary poolside Mexican eatery where guests can enjoy authentic, freshly made burritos and tacos on homemade tortillas, as well as an elaborate toppings and salsa bar. Alchemy Bar: a “cocktail pharmacy”-themed lounge with mixologists who “prescribe” concoctions from different elixirs and ingredients with creative monikers like Forty is the New Twenty and The Restorative Basil Drop. Cherry On Top: the “sweetest spot on board” which celebrates the joys of simple indulgences with bins of bulk candy, fun fanciful gifts and novelties, custom apparel and more. The newly refurbished pool deck area aboard Carnival Sensation. Photo courtesy of Carnival. There’s a six-story atrium flanked by glass-sided elevators, and a playful design motif with ultraviolet lighting and wild colors worked into the art and architecture of the ship. You can stroll between more than 10 bars and lounges, plus a glitzy casino. 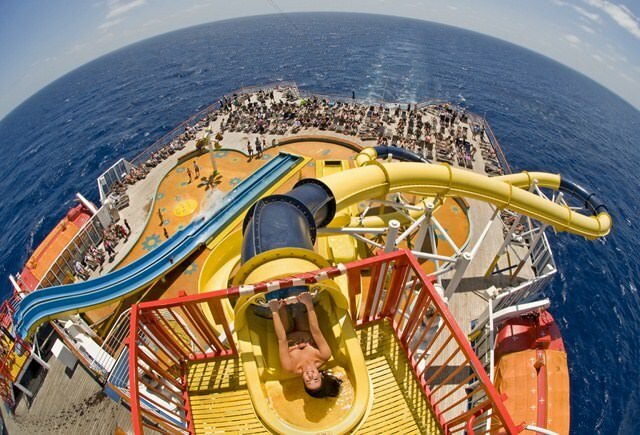 A 300-footlong waterslide adorns the new WaterWorks outdoor aqua park aboard Carnival Sensation. Photo courtesy of Carnival. Like the rest of the Carnival fleet, the Fantasy-class ships offer large cabins, with standards measuring a roomy 185 square feet. The amenities include robes for use during the cruise and super-comfy mattresses and bedding. Only suites have minifridges and hair dryers, and just 54 cabins have balconies. Carnival Sensation’s year-round schedule from Miami includes four-day cruises to Cozumel departing Thursdays that visit Nassau and the private Bahamian destinations of Half Moon Cay or Princess Cays or Cozumel and Key West, or five-day voyages departing Mondays and Saturdays calling at Grand Turk, Nassau and Half Moon Cay or Grand Turk and Amber Cove in the Dominican Republic.